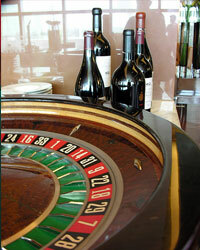 Did you know that roulette wheels are considered to be iconic symbols of nobility and tradition in casinos? They are easily recognized and they create an elegant ambience, too. Roulette is one of the oldest casino games because of two main and very simple reasons: it is fun and extremely easy. In fact, roulette is probably the best game for a beginner to start his or her experiences in gambling. However, it is not exactly the smartest choice due to the odds. The roulette's centerpiece is the magnificently crafted wheel upon which a white ball continues to spin around the groove until it drops into a compartment. Over the years, a lot of mathematicians and scientists have continuously tried to find a way to beat the roulette wheel, but all of their theories so far have failed. See, it is entirely up to chance where the wheel of the roulette stops, and chance is rarely in favor of the players due to the odds. This ensures the casino a lot of profit and because of this, the game of roulette is not the best route to take if you want to become independently rich and wealthy. Still, roulette is an incredibly appealing game. After all, if you manage to get a few betting strategies in the end, you will be able to manage and even expand your whole bankroll while gambling. This can, in turn, become a very pleasant pastime whenever you go to the casino.